Hello! It’s Hilary again from Second Grade is Out of This World! I don’t know about you, but I make a TON of copies every day. I am really lucky that no one is monitoring my copy making. That being said, I needed an efficient way to keep up with forms, writing paper, etc… that ran out after a while. This simple idea was I admit accidental. One day I was making copies, and I put a stack of paper on top of my original. When the kiddos got to the original (which was paper clipped to a note to the parents who were making copies), they brought it to my desk, confused. But! I knew then and there I needed more paper and I knew exactly where my original was! So, now I put a bright colored sticky note on the original that says: Please put on Mrs. Gard’s desk. 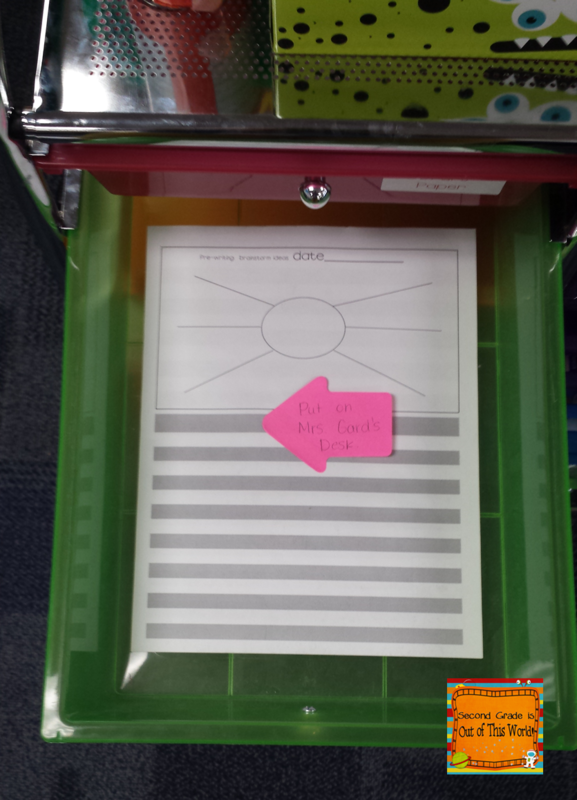 I also explain this routine at the beginning of the year, so the kiddos aren’t too surprised when they find it!